Problem: Lack of electricity or lack of an electrical grinder. 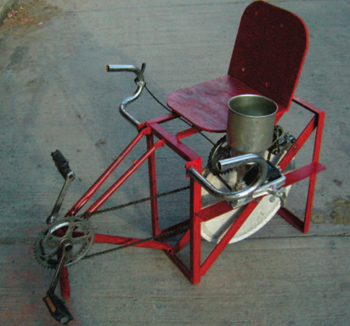 Idea: Combine a bicycle and a hand mill to a pedal-powered mill. Material Needed: Bicycle, metal bars, wood, hand-operated mill, welding device. The machine is easy to operate, easy to maintain and reasonably portable. It can be used anywhere by virtually anyone. It is also a simple matter to switch from degraining to milling by unbolting one appliance and attaching the other.The Mill function has the capacity to mill 3 lbs. per minute of any type of grain or coffee beans. The most common use is for milling yellow maize, soya beans, and other elements that make up animal feed. The Corn Degrainer for example is used postharvest and easily degrains 1200 to 1500 lbs per day. Remove the central spindle. One end accepts the handle, the other end forms part of the grinding mechanism. The handle part is cut off completely and part of a 'cottered'* crank axle is welded on in it's place. It must be square. We use electrodes designed for cast steel to weld this part.The mill will eventually bolt onto the frame. Remove the table mount as shown, leaving a square, flat edge.Our adapted axle needs a pipe shim. Insert one if required and trim any excess. It is now ready to accept a cottered type sprocket with its crank removed. A corn thresher can be adapted in a similar way. The bike frame is cut as above. The frame shown in the pictures has a 450mm eat tube, 250mm down tube. The full length of chain stays. Form the 90 degree corners as shown, cutting, folding and welding the angle iron. Weld the bike frame in place, lining up the sprockets so the chain will run straight. You will need to bend the drive-side chain stay in order to clear the chain. To form a better bond, the frame is flattened and bent before welding it to the chassis. File any sharp edges and paint. The Flywheel shown in the picture is made from a 20� wheel. Both ends of the hub must be threaded to accept sprockets. This can be achieved either by cutting and welding the threaded end from another hub, or by replacing one side of the hub and rebuilding the wheel. The welding option is easier but prone to causing undesirable wobble in the casette. 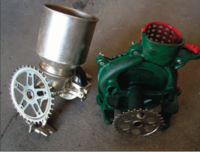 The split image above shows the two options: Above is welded, below is a rebuilt hub. The hub is a push fit construction so it is possible to prise off the redundant unthreaded piece and tap on a threaded one from an identical hub. Fit spokes using a screwdriver, rather than a spoke tensioner for speed. The mould for the concrete is made using a childs bike wheel cover. These are hard to come by, so you may need to improvise. It is kept in place with a cassette and packed with newspaper to prevent leakage. Mix the cement with two parts sand. Place the wheels on a bucket to provide support. Once filled and smoothed over, place in the shade to dry overnight. The concrete is painted to protect from moisture. One side accepts a multi speed cassette, the other a single speed sprocket. The axel position will need to be adjusted accordingly. The seat shown in the picture is recycled plywood. The support is made from thin box section steel. There is a simple bracket in order to make the seat position adjustable. The nut is welded in place for easy tightening. The seat can then be painted. We use steel dropped racer bars. Cut them in half. In order to bolt on the hangle bars, you can weld 8mm bolts onto 20mm washers. These are then welded onto to cut ends of the handlebar and filed smooth. They are then ready to be bolted onto the chassis. The drive side derailleur is bolted in place as it would be on the bike. However it will need to be filed to fit flush with the frame. We use the old style of derailleur that bolts onto the axel rather than the bike frame. Now you can add a gear shifter. A simple friction type is best than an index shifter. Use the adjustment screws on the derailleur to make sure it selects all gears without the chain coming off. Now you can add the 2nd derailleur and the grinder. This derailleur is upside down and its position is fixed. Adjustments are made using the screws. Attach the grinder with clamps to locate its position before drilling the frame and bolting. Aim to have the chain run as straight as possible. This page was last edited on 25 April 2017, at 16:55.